TLDR: Here’s the 101questions page. Start concretely. 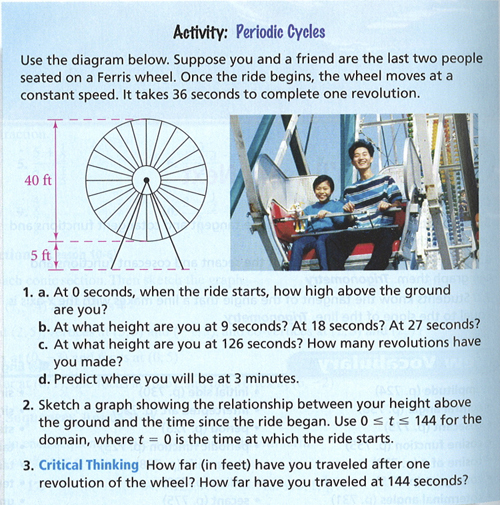 Saying “it takes 40 seconds to complete one revolution” isn’t the same as seeing a ferris wheel travel at that speed. ¶ The task also asks students to trace the path of a car on a ferris wheel, precisely, point by point, for a given domain. We’ll get to that kind of precise abstraction in a minute but for now I’d like an actual sketch. I want to know how my students see the ferris wheel’s motion. Give a reason to give a damn. 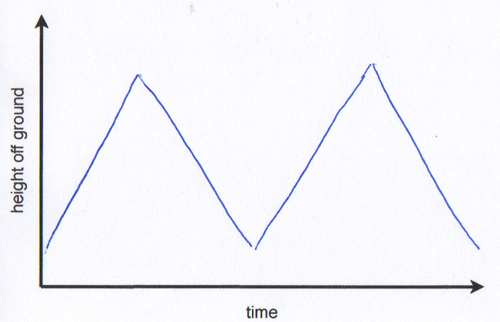 Here, as with our last Makeover Monday, you’re asked to create a graph simply because we said so that’s why. 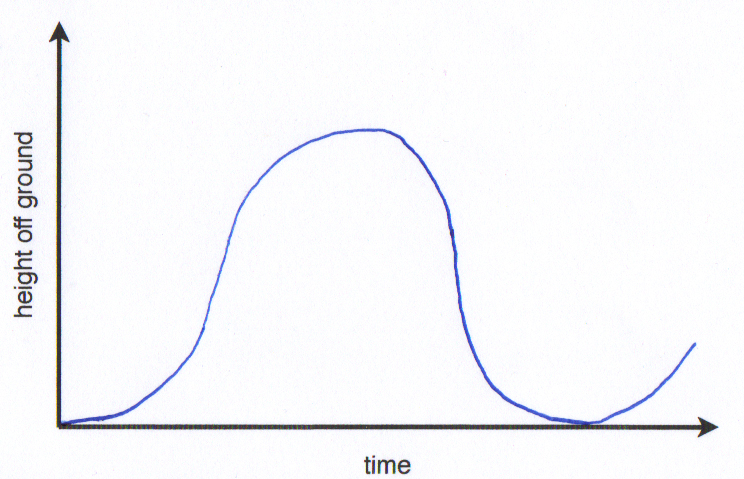 There isn’t any sense that a graph could be useful for anything more interesting than receiving a grade. Prove math works. The task asks students to “Predict where you will be at 3 minutes” but we don’t get the payoff. Do periodic functions actually predict where you’ll be? Do they create smooth maxima and minima or pointy, non-differentiable cusps? If they’re making cusps, they’re suggesting the cart bounces at the top of the ferris wheel. Are all their maxima at the same height? Are all their minima at the same depth? If they’re different, they’re suggesting this metallic ferris wheel shrinks or expands over time. Is the horizontal distance between maxima the same? If they’re different, your students are suggesting the cart isn’t moving at a constant rate, that it speeds up or slows down during the ride. Are their minima a few feet above ground level? Or are they suggesting the red cart hits the ground at the bottom of each turn? In every case, push your students to attend to precision. (Common Core achievement unlocked!) Give them more of these graphs or have them hit erase on the tablet and start again. Get it right. Be precise. Now we’re ready to start the task as written. Use this screenshot with information. Head to Desmos, kids. Punch in points that are more obvious to you. The minima. The maxima. The position at far left and far right. Keep that going. Students need to see that their old models are useless to describe these points. So give them a new one. Out with y=mx+b. In with y=asinb(x+c)+d. Have them mess with the parameters until they get a perfect fit. Then use it to find the position at 3:00. Now show them whether or not the model actually works. How long should a ride last so the person ends at the bottom for an easy exit? A: Lots of different correct answers here. 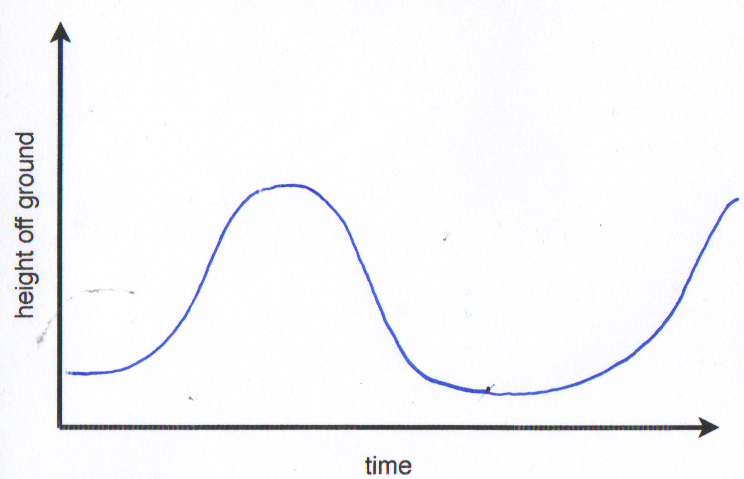 That’s the fun of a periodic function. Hey write out all the correct answers in order and subtract one from the next. What’s happening here? Michael Pershan beats me to the punch and asks his students to just sketch the ferris wheel first. Beth Ferguson draws from a collection of periodic applets. Previously. The preview post where you’ll find some other interesting ideas. P.S., Dan, thanks for the Twitter shout-out! My affections being what they are, for real world application of figuring where you’ll be on a ferris wheel I assume there’s one of two motivations: crime caper or kissing. I want to be stopped at the top so I can be the lookout or because it’ll be all romantic and make my companion want to smooch. If you want it a little realistic you could say the wheel turns as it loads up, then goes for 60 seconds, holds for 10 seconds, turns for 60, holds for another 10, then runs for 60 and unloads. I can think of a few applications for this. One, given the rate the wheel turns – is this a fair stop interval? Or do the same people end up on top both times? Two, if you know this and want to maximize your time on the wheel (regardless of placement – maybe your date will smooch anywhere and/or this gets you away from your pesky little brother for the remainder of the ride) is there a better time to get on the wheel – sooner or later? For time maximization, is first on likely to be first off or last off? Does it matter? This will let you get into some more group discussion/argument about the time involved in loading people on and off. I will use these materials. But they don’t address the trig topic I think needs the most careful conceptual development with kids. 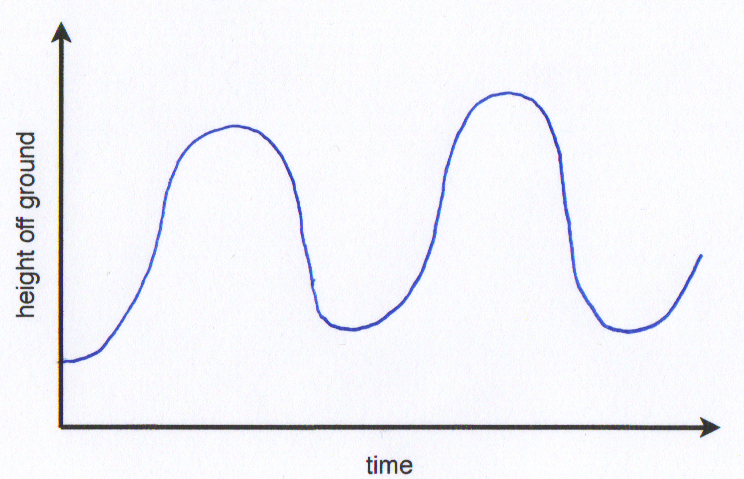 What’s more abstract, and harder to understand, is what sine (which they understand at the beginning as opposite over adjacent) has to do with that wavy graph. So I think I’d like to use the activity as Dan laid out but conceal the name of the function. I’m not sure how to do that on Desmos, but you could do it on GeoGebra. Just don’t let them see that it’s sin (x). After Act 3, I’d like to ask them how high the red dot would be at some random time that’s not a multiple of 1/4 rotation. That way they’d have to draw a triangle and actually use the sine or cosine to find the height after rotating, say 3000 degrees. For this purpose, it would be better if the ferris wheel rotated in the other direction, because that mimics positive rotation on the unit circle. I wanted to get to this this summer, but here’s what stumped me. How can I get kids perplexed and wanting to know where the dot on the rotating circle would be after 10 seconds? My thought was to do something that’s a take-off of the OK Go Chevy Sonic music video. Like they have to do a music video, and at the grand finale (which according to the song will happen at a given value of time), they have to shoot a laser at a target on a rotating drum. So they have to aim the laser correctly, so they have to know the precise position to which the target will have rotated at that time. Then they have some anticipation about “will it work or won’t it?”. But I haven’t gotten around to it. If anybody has any suggestions or ideas, that’s be great. I like the idea of providing a simulation or video, and then asking for a sketch and pushing for specificity. If you are focused on graphing, I like the idea of changing some feature of the wheel and asking for another sketch. Or giving a sketch and asking for information about the wheel. I don’t understand the rational for giving them a form of an equation (y = asin(bx – c) + d) they do not understand and asking them to play around with parameters to make it fit. Doesn’t that encourage superficial thinking – sort of like “b” is the y-intercept and “m” is the slope because…, well because that is the way it works? What if a student asks why that kind of equation makes that kind of graph? That is a three or four day explanation. I love Desmos, but what does it give us that the sketch did not? What Desmos gives that the sketch does not is the perfect fit. Without it, you can’t get the “holy crap!” moment of seeing that the model fit the video in Act 3 perfectly. I might show a video of this: http://www.youtube.com/watch?v=g8d63aFposU (Big Seattle Ferris Wheel starting at 0:55), and this http://www.youtube.com/watch?v=0FjddxnLMmY (Small Human Powered Ferris Wheel). 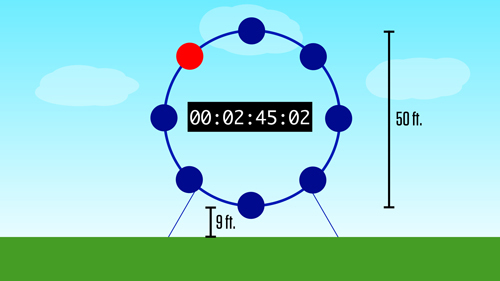 Or use a geogebra applet: http://www.geogebratube.org/student/m45663 to model the ferris wheels. 1)	Which ride looks like more fun? What are some similarities and differences? Which ride do you think is faster? 2)	Suppose each ride only lasted two loops. Which ride could handle more people in an hour? 3)	Sadly, you and your friend were not able to get on the same car for the big ride. Will you ever be at the same height? If so, where? And when? 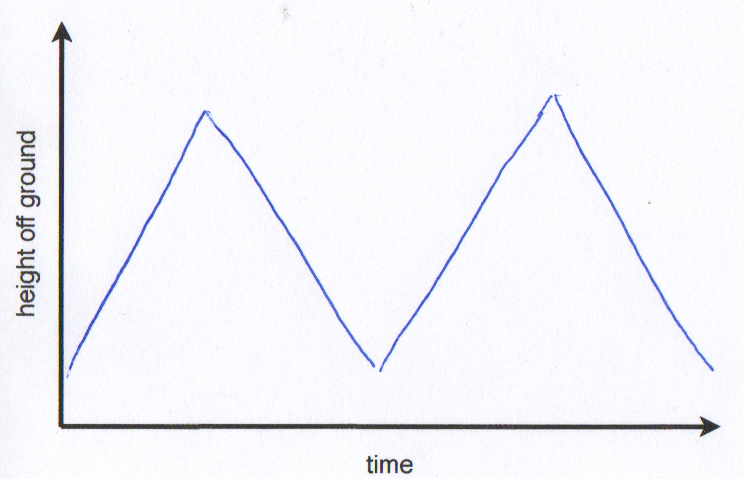 4)	Suppose each ride lasted the same amount of time. How many loops would you get on the smaller ride compared to the the larger ride? How much distance would you have covered on the smaller ride compared to the larger ride? 5)	How many miles per hour would you be travelling on each ride? 6)	Sketch the height of the first car as a function of time for each ride. I should clarify that in my idea, the target would be a photoelectric sensor, and if you hit it, something cool would happen, a la OK Go. I hodge, I couldn’t get your link to work, but it could be my lame work computer’s fault. The plugins and other software are out of date. What Kevin and hodge already said… this part “Out with y=mx+b. In with y=asinb(x+c)+d” made me go “what…the…hell?” You’re not suggesting dropping that on them out of nowhere, I hope. Ouch. Based on some thoughts I’ve read on this site and others. I tried remaking this problem with several different “layers” that students could see at the same time. After we discussed and slowly added layers it was pretty amazing; in the end I didn’t need to say anything but show the video and student’s minds were abuzz with making connections. Light bulbs were going off left and right. This is definitely something I will try in the future. Thanks for all your thoughts Dan they have really helped me grow professionally.